A New and Accurate Map of Ireland. 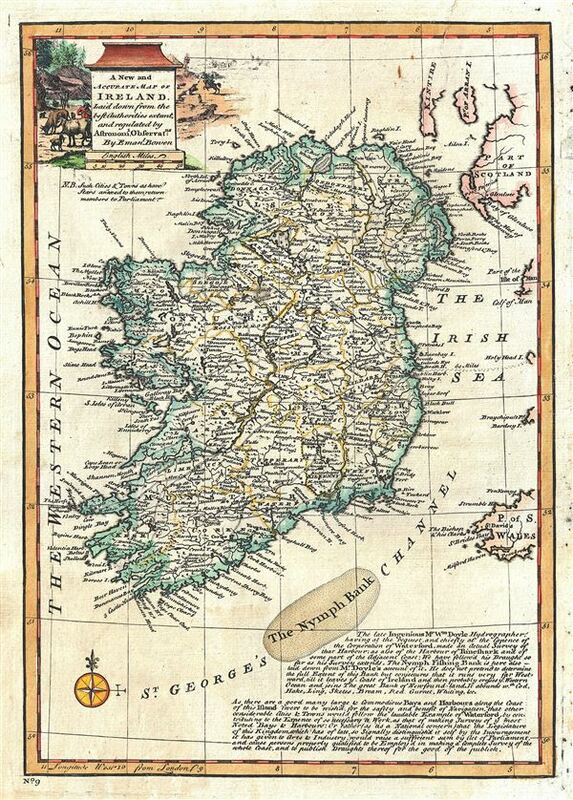 This is an appealing 1747 map of Ireland by the British cartographer Emanuel Bowen. The map covers all of Ireland, noting important towns, cities bays, harbors, roads, etc. Forests, mountains are rendered pictorially. The lower right quadrant of the map includes notes about the bays and harbors along the coast of Ireland, and about the Nymph Bank according to Mr. William Doyle's accounts. A beautifully illustrated title cartouche in the upper left quadrant depicts scenes of hunting and cattle grazing. This map was prepares by Emanuel Bowen as plate no. 9 for the 1747 issue of A Complete System of Geography. Very good. Original platemark visible. Minor wear and verso repair over top border, extending up to an inch over printed area. Verso repair on bottom and right border, not extending onto printed area. Rumsey 3733.008. Philips (atlases) 614 (1752 edition).